Yesterday was a rough day. I read the news that Google Reader was being shut down and I didn't believe it. I read the paragraph several times before the news sunk in. Then I took to Twitter to see what others were saying. I honestly don't remember what happened around me during the hour following the news, I was lost in a sea of dismay, commiserating with other dedicated Reader users. I felt like I'd been punched in the gut. Within an hour, the news had rocketed to the top of Twitter's trending topics, even out-trending the new pope. Even now as I write this, it's still the number one trending topic. Globally. We have until July 1st to move to a different service. The worst part is that there really aren't any viable alternatives...and the alternatives that do exist all crashed yesterday under the crushing load of former Reader users rushing for a replacement. Personally, I've been using Google Reader since 2005 and have read hundreds of thousands of articles. Reader stops counting at 300,000...and mine has said 300,000+ for years. I spent most of last night legitimately freaking out. Reader is an essential part of my day. Between the desktop site and mobile app, I check Reader multiple times a day and rely on it to keep tabs on dozens of sources, from tech industry news, mobile phone news, Disney news, funny pictures, etc. The very thought of not having it feels like the power going out at home: I just wander around in the dark, not really knowing what to do. And everything I think of to do relies on electricity. 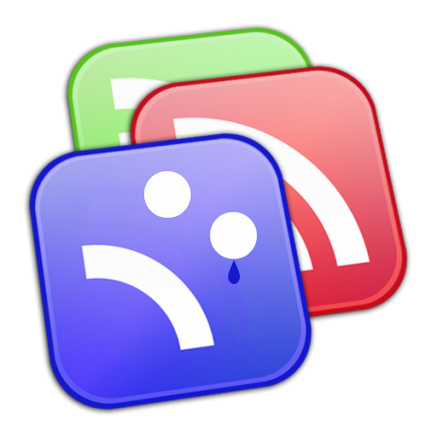 Nearly everything I do on the Internet centers around Google Reader, and I know a lot of other people feel the same. Reader is easily my second most visited website after Gmail. This is a great loss for a large number of people. And don't even think about suggesting social media as a replacement. Anyone who thinks Twitter is a viable alternative is, quite frankly, clueless. At this point, the shock of the loss has warn off. I have three months of Reader left and I intend to enjoy it while I can. In the meantime, we can only hope that Google either changes its mind, or that an enterprising new service springs up to fill the gap. Some alternatives are already making themselves known, including Feedly, Newsblur, The Old Reader, etc. I'll be trying them all over the next few months, and I'll share my thoughts here. A large part of the open web has been lost here, and I suspect other casualties will follow. Feedburner is probably next, and the whole notion of RSS in general. That's a topic for another blog post, however. For now, though, let's just enjoy what time we have left. Rest in peace, Reader. You will be missed.